You haven’t heard of Cold Souls. No one has. 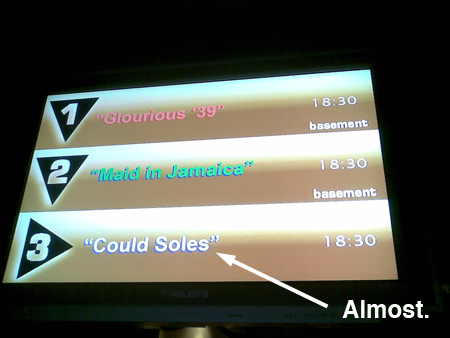 Evidently, even the guy who handles the video monitor at the screening venue hadn’t heard of Cold Souls. Or even the words ‘cold’ or ‘soul’ for that matter. I put up the trailer yesterday so have a look at that if you’re remotely interested. It features an American character actor playing a warped version of themselves, somewhat like Charlie Kaufman’s Being John Malkovich. The central character is struggling to cope with his involvement in an intense new theatre production, somewhat like Charlie Kaufman’s Synecdoche New York. In desperation, he seeks the help of a strange new medical corporation who promise to relieve stress by removing a metaphysical part of the patient’s body, somewhat like Charlie Kaufman’s Eternal Sunshine of the Spotless Mind. As a result, other people are able to ‘live the life’ of the actor, if only for a limited period of time, somewhat like Charlie Kaufman’s Being John Malkovich. Oh, and Cold Souls is not directed by Charlie Kaufman. Obviously.